Wet crawl space, cracks in walls. I have a house in Blountville that has water intrusion every time it rains. We are interested in getting our crawl space inspected and requesting an estimate for an encapsulation be done. I have insulation falling down in my crawlspace. We have an unlevel garage floor at a property located at 361 Buffalo Road Bluff City, TN. One corner of the floor has settled some. The garage has a second floor and it is causing cracks in the walls. We would like to get an estimate on repairs. Hi - I wanted to get a free estimate for a vapor barrier in our crawl pace. Master Dry was quick and has a great reputation!! We have not yet had a rain like we had in July so the effectiveness of the drainage system and sump pump have not been fully tested yet. Showed up on time on date scheduled. We not only adhere to the highest industry standards, we strive to be the industry leader in the home improvement related services we provide. We also use state-of-the-art products and technology which are designed to fix your home. We are the professional Basement Systems dealer in Bristol, TN. 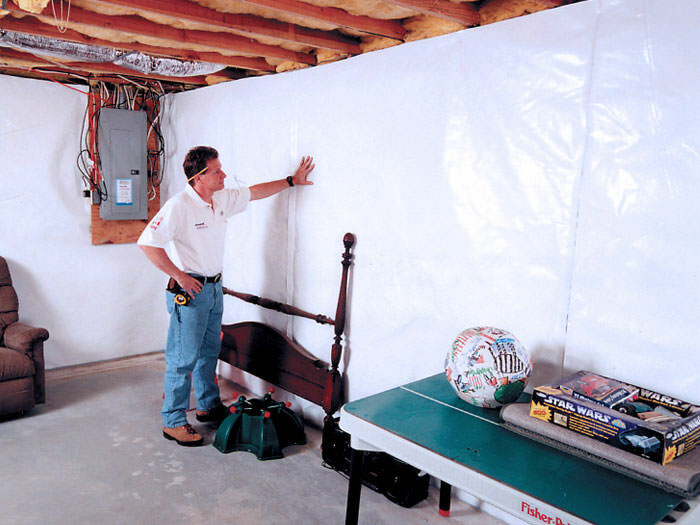 We will properly install a hidden drainage system in your Bristol basement and completely encapsulate your crawl space with CleanSpace vapor barrier. We are here to solve the problem for you. Foundation problems destroy your Bristol home’s value and can be dangerous. Our in-house team of structural and geo-technical engineers are here to help. Most of the time, projects that look enormous are really caused by shifting, weakened soil that can no longer support the weight of the structure. We design and install the right solution and usually have the project finished in less than a week. The sunken and cracked concrete around your Bristol home is both an eyesore and a safety hazard. It is also likely to get worse, but we can fix it for you. Master Service Companies has the tools and the expertise to get the job done right the first time. Trust our friendly, knowledgeable staff and professional technicians to find a solution that will work best for you. Call us today for a free estimate! IT seems there are stopped up gutter downspouts and incorrect usage of materials that is causing washout of the foundation and standing water in the crawl space. It looks like a waterfall during heavy rain coming out of the connection of the gutter downspout and the plastic pipe going underground for the front area. Have some water seepage in exterior block wall in the garage. There are some cracks in the foundation along with some humps in the flooring of the house. I was looking up someone to tell me if there was black mold in our garage and google directed me to you. Do yall do that type of work? Purchased house 3 months ago, have water in basement from recent heavy rains. External and internal foundation wall cracks, basement flooring cracks, wall/ceiling cracks in rooms upstairs, uneven flooring, squeaking floors. 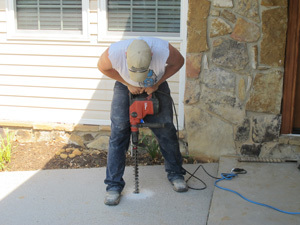 Sidewalk leveling, encapsulating crawlspace, dehumidifier.